Homeowners in isolated parts of the country may not have their electricity supply restored until next Tuesday. As many as 16,000 households face being left without power until after the weekend - meaning they will be a week without power. And efforts to restore energy, water and broadband services could be hampered by bad weather today, with strong winds also forecast to hit the country over the weekend. As of 5pm yesterday, the ESB said that 105,000 households were without power since Storm Ophelia struck on Monday, with most to have supply restored by Sunday. Some 2,500 ESB staff and 1,000 contractors have re-powered 280,000 homes and businesses since Monday; 283 staff from utilities in the UK and France are also working to identify faults and restore supply. But some homeowners in rural areas face being cut-off until early next week, the utility said. While the bulk will be re-connected by close of business today, the ESB's powercheck.ie website lists suggests that 9,000 are due to have power restored tomorrow, another 4,000 over the weekend and almost 230 on Monday and Tuesday. There is no date to reconnect another 16,000. "The big gains have been made in the last few days but we're now on a bigger slog," he said. Asked about the incoming weather system, he replied: "Our staff will work in those conditions but it will slow down the work." An ESB spokesman said that crews were working to identify faults, and then it would take time to assess the damage before completing repairs. In some cases, when a fault was repaired it would trigger other faults in the network. Irish Water also said that some homes will be without drinking water supplies until the weekend, with pollution concerns now rising as raw sewage is being discharged from some treatment plants which cannot process wastewater because there is no power. Most affected households are in Cork, Waterford and Wexford. As of yesterday afternoon, some 25,000 had no supply and another 2,000 were at risk of losing their water supply. "It will take a few days to get to the end of that number. We're talking about reducing that down where nobody will be out of water over the next couple of days," operational, planning and emergency manager Katherine Walshe said. "We would hope the majority of people would be back by the weekend." Some smaller plants, catering for populations of up to 1,000, were still without mains power, but generators were being used to supply the electricity needed to treat water, making it safe to drink. Tankers were also being deployed to areas with drinking-water shortages. Raw sewage was being discharged from some of the 44 wastewater treatment plants without power, and the situation was being monitored by the Environmental Protection Agency. Wastewater was being removed in tankers for treatment elsewhere, while generators were also being deployed. Eir also says that some 290 towns across the State continue to experience issues with broadband and telephone, with some 85,000 customers without a service. The southern half of the country is most affected, and it said it expected individual line faults would arise. 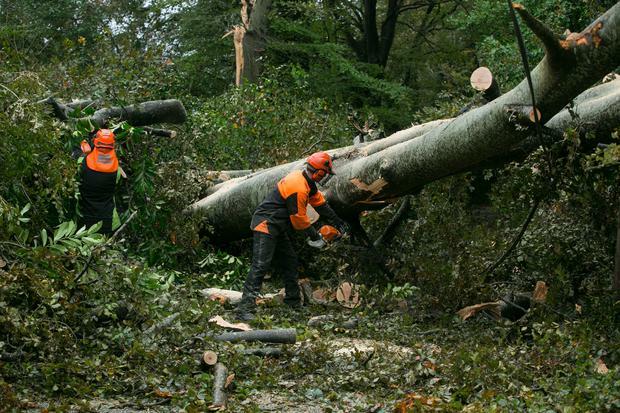 "Given the overhead nature of our network in rural areas, the damage is extensive and repair work will take time," it said, adding that 1,200 staff were working to assess and repair damage. Some 400 reports of dangerous poles or cables had been reported, which posed a safety risk. Graham Clifford It was the photo that captured a moment of peace among days of chaos during Hurricane Ophelia. Ralph Riegel Two men who died after suffering fatal injuries while carrying out repairs to damage caused by Hurricane Ophelia and Storm Brian have been named locally.